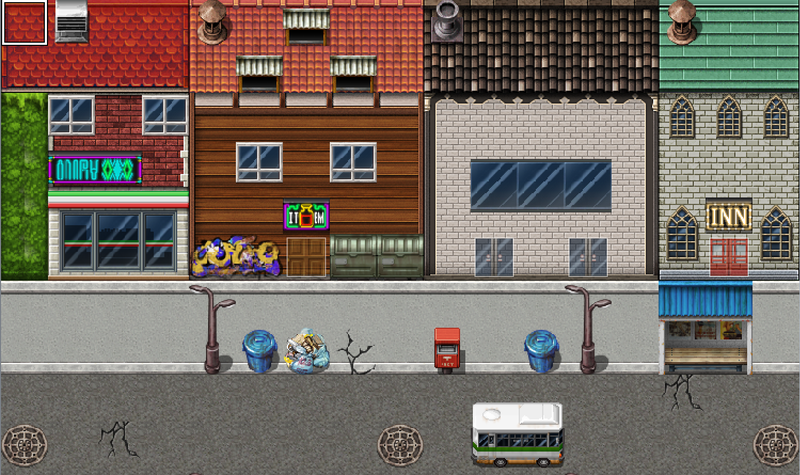 A city street area from the game I’m working on. In the past, I’ve thought a little about making a game, but never got around to learning actual coding. Recently, I’ve started to develop that abstract “what if” idea into a passion project of my own. I’m learning how to create maps, program quests, and write cutscenes with the help of a program that can build RPGs. Through this process, I’ve encountered a variety of challenges that have helped me appreciate games so much more now. At some point in our lives, I’m sure we’ve all made an “impulse buy.” Maybe you’ve gone through a store and found a super cool t-shirt hanging on a rack. As you stare at it, you can hear the shirt screaming, “Take me home with you!” so you just buy it. Well, last week, I made an impulse buy on RPG Maker MV, which was on sale at the time. Normally RPG Maker MV retails for 79.99, but I was able to grab it for under 25 dollars. While RPG Maker MV has mostly positive reviews on Steam, there are a handful of people who openly despise it. These individuals complain that “It’s not meant for large scale projects,”; that the program has difficulties in exporting games to different platforms, and that everything from maps to characters looks the same. The last criticism is unfair, as while the program doesn’t come with the nicest-looking assets, it will still allows you to import and install your own custom character details and tilesets. For the most part, this is what I plan to do. I want to create an action slice-of-life RPG set in a 1990s high school, which will follow the lives of two characters over a long period of time. Setting it in this time period is challenging, because it requires more modern buildings and furniture tilesets which I have to look for online, or design myself. Not only that, it requires researching 90s fashion for character designs—speaking of which, why were razor thin eyebrows ever in style? I also wanted the option of adding different hairstyles, so I downloaded expansion packs from the RPG Maker forums. Many of these assets are generously made by community members and can be used freely for commercial or noncommercial projects, as long as you credit them. In order to add them to the program, I need to manually rename the files so they don’t overwrite existing ones, and add them to the appropriate folder. One of my characters, who I think looks really great, although I may change her outfit later. Her hairstyle was developed by Jack Saintsworth. I incorrectly named and imported these hairstyles. So for whatever reason, it’s making an afro hairstyle in the front with dreadlocks in the back. Whoops. These hairstyles are also made by Jack Saintsworth. From left to right: one of my characters with a neutral face expression, that same character with an angry face expression, and then the default male character you get when you open up the character generator. Screenshot of Squidward taking a tiny bite from a Krabby Patty, taken from this YouTube video posted by I love controversy. After writing the dialogue for one event in a nurse’s office and moving NPCs out of the way, I programmed the event to change to control switch A. This prevents the cutscene from repeating itself and also stops the game from freezing, which will allow the player to walk around. Sounds simple enough, but when you’re trying to program multiple things in the scene all at once, it quickly becomes difficult. In that same scene, I couldn’t figure out why one of my NPCs kept saying the dialogue that was supposed to occur after a switch. Each error takes considerable time to tinker with and solve, not to mention you have to playtest after you fix it in order to make sure it works. I realized in that situation that because my cutscene event was on the same switch as this character’s dialogue, he was switching to the other set of dialogue automatically. So, I had to use a different switch in order for him to use that first speech. The door has disappeared and unfortunately she’s trapped in a bathroom forever. I’m kidding. The door still works, but for whatever reason, the image of the door disappeared. That’s just one more thing on my to-do list. Although it has its flaws, RPG Maker MV has empowered me, a clueless newbie, to start creating games. While I certainly don’t have everything worked out in terms of story, and I’m not looking forward to fixing bugs, making a game has been a lot of fun so far.